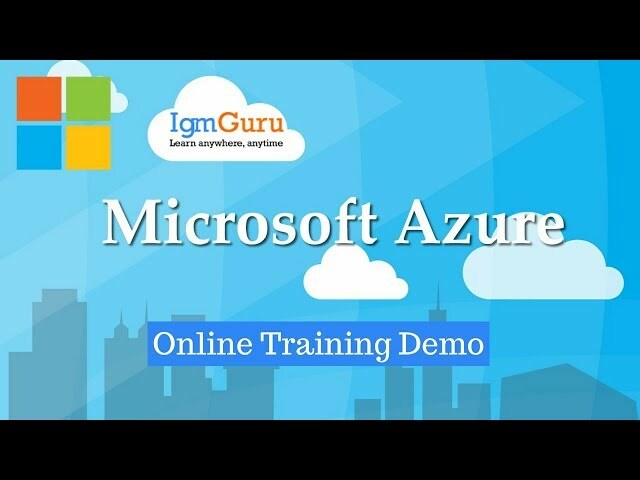 IgmGuru’s Azure Infrastructure Online Training & Certification program is designed according to Microsoft Azure Infrastructure 70-533 Certification Exam to make the sure candidate pass the exam on the first attempt. Decide how to upgrade Windows Server remaining burdens on Azure and investigate IaaS design, administrations, devices, and gateways of Microsoft Azure. What’s this course focus on? Achieving Microsoft Azure Infrastructure Solutions (70-533) certification learning program will help you determine your ability in Microsoft Azure infrastructure solution implementation. Through demos & practical applications, you’ll grasp to optimize Windows Server workloads on Azure and explore IaaS architecture. Azure Infrastructure Online Training course will help you to implement enterprise application architecture on the Azure platform. Implement website and web apps. Who should opt for this course? In what manner will I turn into a guaranteed Microsoft Azure 70-533: Implementing Microsoft Azure Infrastructure Solutions? Q : What is Online Classroom preparing? A :Online Classroom preparing for 70-533 is alive preparing by means of online live spilling of a class. This is controlled by Microsoft guaranteed mentor with more than 15 years of work involved in the area and preparing. The class went to by the worldwide group of onlookers can advance your learning knowledge. You simply require earphones for rich sound involvement. Q : Is exam expense incorporated into the course charge? A :No. The exam expense is excluded from the course charge. Q : Who are the mentors for the live classroom preparing? A :All Our Trainers are Microsoft affirmed and exceedingly qualified with over 10 years of involvement in preparing and are working in the area. Q : How would I gain admittance to Azure Platform?